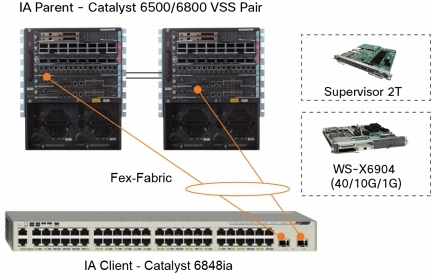 Cisco Catalyst Instant Access combines a group of Catalyst 6800ia access-layer switches with a Catalyst 6800 (or properly equipped 6500) into a system with a single control plane. In other words, you can manage all of these devices as one big switch. This is somewhat like stacking, if you’re familiar with Catalyst 3750 stacks – all the switches in the stack are managed as a single entity. That said, don’t confuse 6800ia uplinking to distribution switches as stacking. The technology is rather different. 6800ia’s are much more like Nexus 2K fabric extenders (FEX); the best analogy is to think of them as remote line cards. For those who’ve worked with FEX, the Instant Access technology is very close. The command line looks very much the same. IA’s are even called FEX when reported by the parent 6500/6800 CLI. And just like FEX, a 6800ia doesn’t do any local switching, although the silicon is reportedly capable of it. All traffic travels down to the parent switch for switching services. If that bothers you a bit, think that the majority of end user traffic is north-south. Hairpinning should be rare enough to not impact most network designs, but is still worth noting as local switching at the access layer is generally assumed. Cisco makes the point that with Instant Access, you get Catalyst 6500/6800 features at the access later. If you are a Cat6500 shop, you’ll need the Sup2T + X6904 line card to support the 6800ia. This is because VN-Tag is used to encapsulate traffic between the 6800ia and the 6500/6800 at the other end. The system scales meaningfully. Today, Cisco is delivering 1,000 total ports from a single point of management across 21 switches. In keeping with the target market, you can hang a switch off of a 6800ia (unlike FEX). In addition, there are PoE model 6800ia’s. Cisco Catalyst Instant Access Whitepaper. Cisco Catalyst 6800ia product home page. My NetworkComputing.com piece on Cat6800 product line announcement. What is VN-Tag vs. VEPA? Whatever happened to non-proprietary & standards based fabrics?